How many times have you been reading and not known a word? Maybe said to yourself, "I'll look it up later"? We've got you covered! Between Billy's hacking TeenWords and Charley's old school adventures, we'll be sharing a WoW word every week, including where that word comes from and how it works in a sentence, or something. Have a word you don't feel like looking up? Tell us about it! 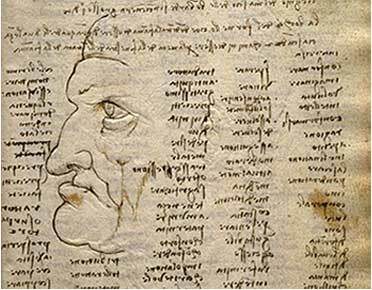 According to a timeline by noted da Vinci scholar Michael Kemp, Universal Leonardo, the Codex Trivulzianus is one of Leonardo's earliest known manuscripts. Many pages take the form of word lists; Leonardo had a strong interest in Italian language and literature, and in Latin, which he taught himself. The Codex also includes architectural drawings relating to plans for a crossing-dome for Milan Cathedral, and a portrait doodle or two! The manuscript contains 55 sheets of an original 62 in its original binding, with some booklets bound in upside down.